You take a vacation, and all hell breaks loose! Some ads prepared by Rep. Joe Heck’s campaign show the “corruption” attacks on Catherine Cortez Masto aren’t going to stop anytime soon. Why, oh why, didn’t you do your job, former Attorney General Catherine Cortez Masto? That’s the plaintive cry of a voice actress playing a young Facebook user in a TV ad ostensibly trying to understand why the ex-AG of Nevada could possibly have left the state for official trips with various groups, even as the crime rate here was rising. “Hello? Masto? You were elected to fight crime in Nevada, not sip wine in Napa. Why didn’t you do your job?” the girl asks. Come to think of it, it is a perplexing question, since the number of trips an attorney general takes out of state has about as much to do with the crime rate as the kind of wine she sips in Napa Valley, which is to say, nothing. Nine separate ads repeat the claim that Cortez Masto’s alleged corruption led to rising crime rates in the state. But the ads, like previous attacks from the Heck campaign, only measure the crime rate in the period of 2010-2014, Cortez Masto’s second and final term. Over her entire tenure as attorney general (2007-2015), crime rates actually fell. How that could possibly be true with all those trips remains a mystery. 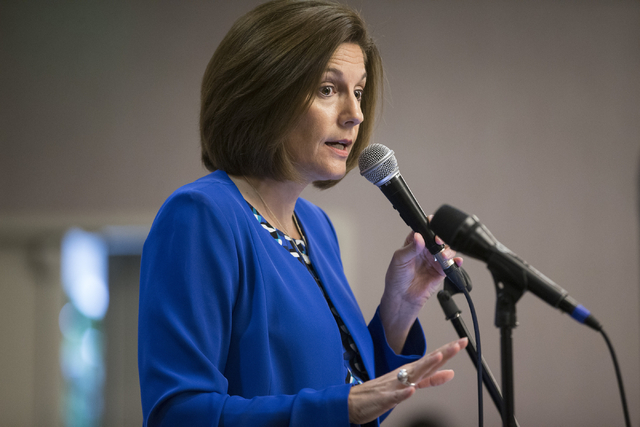 Baluta said the ads — all of which point users to a website that explicitly calls Cortez Masto corrupt and provides examples to support the charge — may not all run, but that the campaign prepared them to drive traffic to the website. “We may use them, we may not,” he said. In one ad, tropical music plays over a Hawaiian beach as we learn Cortez Masto took trips with official groups, including the Democratic Attorney Generals Association, to various locations for conferences. In another, the exasperated Facebook user pretends alarm at news of rising crime rates before blaming Cortez Masto because of her absences from the state. But it’s not as if Cortez Masto was a police dispatcher, a bank security guard or a beat cop, someone who’s physical absence from a job might actually allow a crime to occur. It’s very likely that each and every crime recorded during Cortez Masto’s tenure would have happened whether she was participating in a seminar in Hawaii or sitting at her desk in Carson City, legal pad at the ready. In other ads, the truth is stretched a bit to make a point. “It’s a prison break. But this time, a corrupt politician is in on the job!” a female announce intones. But Cortez Masto didn’t tunnel into the Ely State prison to help inmates escape. According to the Reno Gazette-Journal, Cortez Masto incorrect legal advice led to inmates serving time for DUI with injury or death to be released before their statutory minimum sentence had been served. A serious error, to be sure, but surely not corruption. Yet another accuses Cortez Masto of signing an illegal contract, citing a Wall Street Journal editorial. But that editorial misreads state law; the contracts were perfectly within the attorney general’s authority. And another accuses her of accepting donations from “D.C. lobbyists and special interests,” as the headline of an infamous New York Times expose about groups that try to curry favor with attorneys general of both parties flashes on the screen. A search reveals, however, that that the Oct. 29, 2014 story does not mention Nevada or Cortez Masto. I’ve opined elsewhere that there are facts in Cortez Masto’s record that her opponents can legitimately use against her, like the contrast between her indictment of a Republican lieutenant governor accused in an audit of mishandling state funds and her handling of the case of a longtime Democrat who pocketed more than $120,000 from his own campaign. (In fairness, I should disclose that I strongly encouraged the case against the lieutenant governor in the pages of the now-defunct Las Vegas CityLife newspaper, when I was its editor.) Cortez Masto also refused the orders of two Republican governors to take legal action when she didn’t think doing so was proper. But these ads attempt to go one bridge too far, levying a charge of corruption where it does not fit (for example, almost all public officials attend official conventions put on by groups, ranging from governors to statewide officials to members of the Legislature and even local governments). It’s difficult to alleged that a single public official, whether an AG, a DA or even a sheriff, can singlehandedly be held responsible for an increase (or a decrease) in the crime rate, let alone that attending a seminar had such an impact. Heck’s campaign is certainly entitled to comb over Cortez Masto’s record and identify things that undercut her campaign’s law-and-order message (in fact, that follows a popular political strategy to attack an opponent where she’s the strongest). But the campaign should know there’s a breaking point at which stretching those facts too far will cause them to snap. That’s worth remembering since it doesn’t appear the “corruption” meme is going to go away anytime soon.